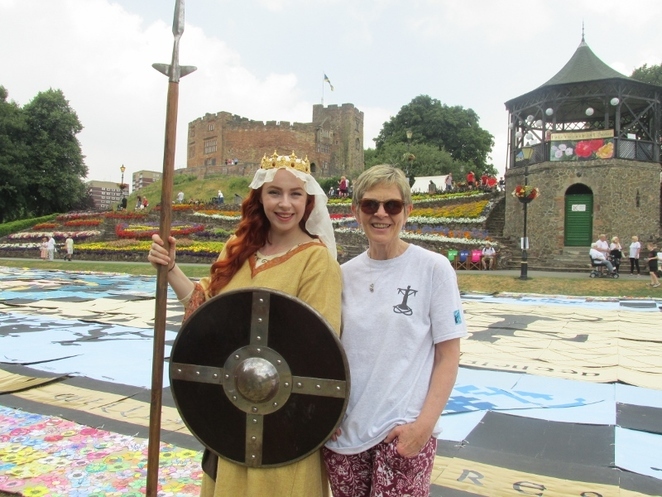 The culmination of two years' hard planning and work was finally realised on a glorious day in the grounds of medieval Tamworth Castle in Staffordshire when the huge Mercian Mosaic was unveiled to the public for the first and only time. 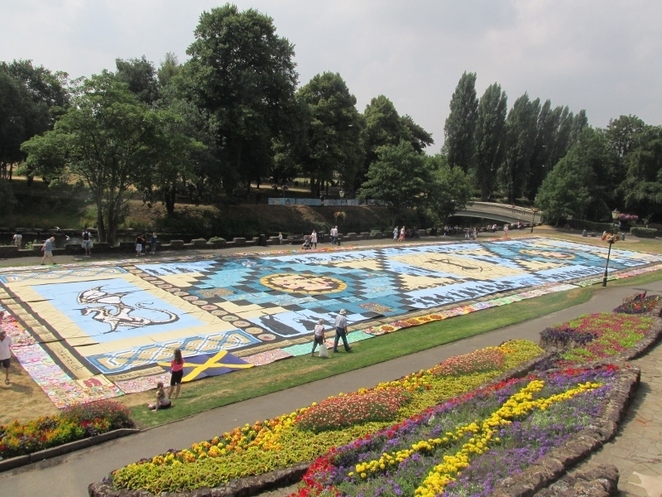 The huge mosaic consisted of an amazing 1,400 individually decorated tiles each measuring one square yard. 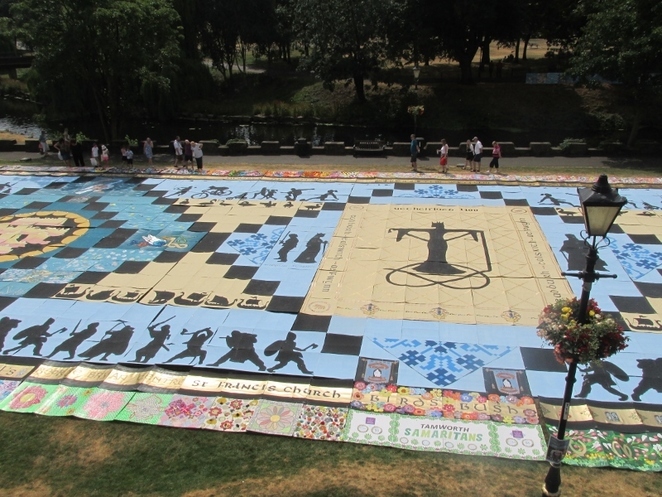 And, when the tiles were all laid out on the lower lawn of the Castle Grounds on Saturday 14th July, the collective mosaic covered an area measuring 70 yards by 20 yards. Mercian Mosaic was the result of an ambitious project by Tamworth Borough Council's Arts & Events team as part of Arts in Unusual Spaces. It was led by locally-based artist Maggie Carney, who was commissioned to come up with the intricate design celebrating Tamworth's rich Anglo Saxon history. At the centre of the mosaic lies the 'warrior queen' Aethelflaed, the Lady of the Mercians, who played a key role in English history by driving the Viking invaders out of the ancient Kingdom of Mercia that covered much of present-day central England. This year is the 1,100th anniversary of her death in 918AD. The 1,400 tiles that made up the mosaic were tied together in smaller sections before being carried to the grounds and laid out by around 30 volunteers on the morning of July 14 ready for the live reveal. 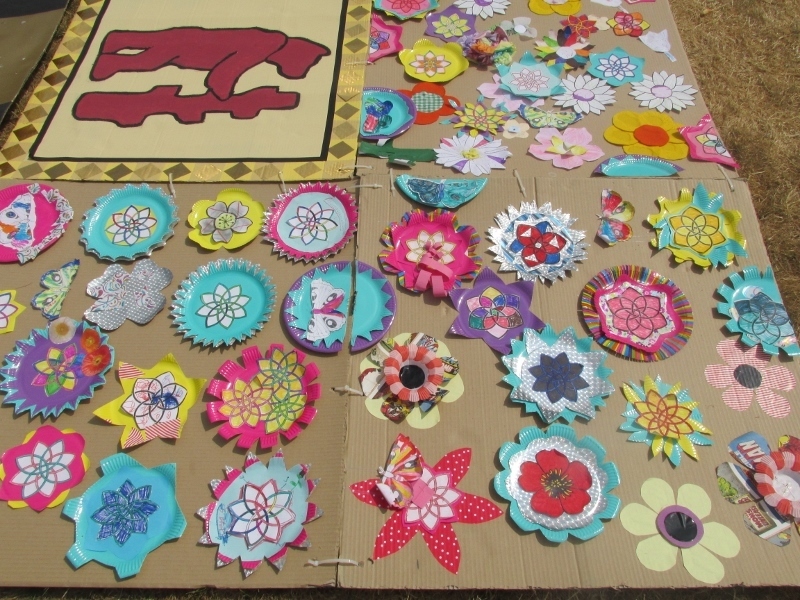 Hundreds of children and adults contributed to the overall project. Artist Maggie Carney was understandably delighted at the unveiling of the mosaic, along with the Mayor of Tamworth, Councillor Peter Thurgood, and modern-day Aethelflaed, Olivia Shepherd, in medieval costume. Maggie said: "I was quite emotional when I saw it all laid out. It has been a real labour of love. We have done it in sections so it's only when you see every piece side by side that you get the complete picture. There was certainly a lump in my throat, but it's been a real community effort, with the oldest person who took part being 87 down to three-year-olds." The mosaic will largely be broken up straight away. However, the central section, together with some of the floral border, will remain on the lower lawn of Tamworth Castle Grounds until Tuesday 17th July when judges from the annual Tamworth in Bloom competition visit the town. Various local schools who decorated sections of tiles will be able to have their creations back, while some may be offered up to local organisations or institutions. For example, the tiles illustrating Anglo Saxon warriors may find a home within neighbouring Tamworth Castle itself. As well as the unveiling of the Mercian Mosaic, which forms part of the four-day Aethelfest activities, visitors could enjoy a Saxon encampment on the upper lawn of the castle grounds. This included activities such as coin making, toys and games. 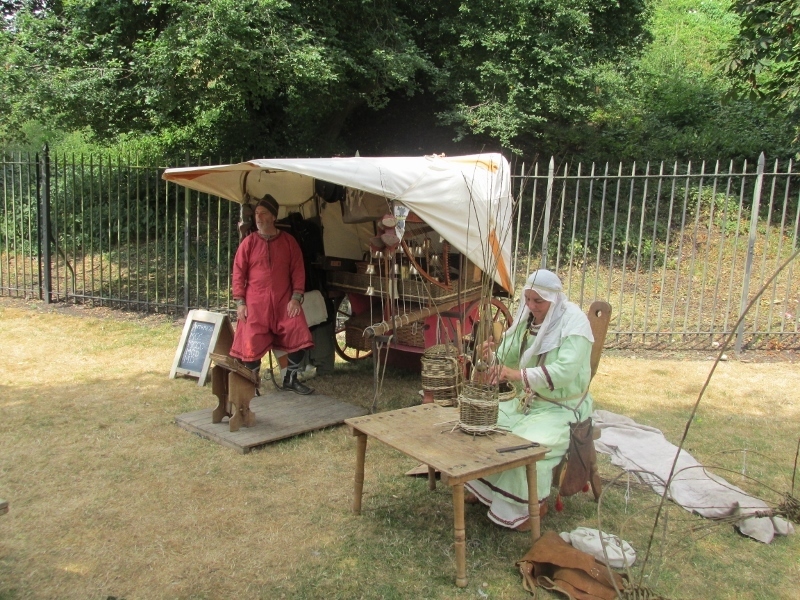 And alongside the free entertainment in the grounds, Tamworth Castle itself hosted its own Saxon Living History event with normal admission charges applying. Visitors could discover what life was like for those living in Tamworth during Anglo Saxon times, as well as learn about battle tactics from the era, have a go at digging for artefacts, and even try taking their place in a shield wall. Other events being held over the course of the four-day Aethelfest celebration included a special guided walking tour of Anglo-Saxon Tamworth with the Guild of Town Guides and the launch of a new Aethelflaed Ale, called 'Our Aethel' which has been brewed by Tamworth Brewing Co in Market Street. Further information about all the events can be found by visiting www.aethelflaed.co.uk.